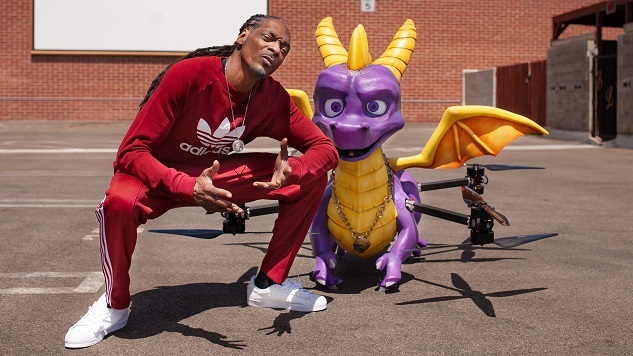 The first three Spyro the Dragon games have been remastered and collected together in the new Spyro Reignited Trilogy, and to celebrate Activision had a life-sized Spyro drone deliver the first copy to Spyro’s biggest fan: Snoop Dogg. The breakout star of Dr. Dre’s The Chronic, and the man who soundtracked too many of my junior year parties and rides to school with “Gin & Juice,” “Murder Was the Case” and more, will be the first to play the updated and upgraded adventures of an adorable purple dragon exploring a magical land of whimsy. The Spyro drone didn’t simply fly straight to Snoop’s doorstep. He went on a short coast to coast tour, starting in New York and ending in California. (Spyro claims he had nothing to do with those terrible wildfires, and so far we’ll just have to believe him.) In between he stopped at various locales that recall classic levels from those early Spyro games, like a golf club in Vail that stood in for Icy Peak, and a Nashville BBQ joint that represented the Molten Crater. Yeah, did we mention this drone spat fire? Just like Snoop. Spyro might’ve had some great adventures during his American trek, but all along there was only one destination: Snoop Dogg’s house in California. Snoop and Spyro were made for each other, and probably not just because of this elaborate media stunt: they’re two souls who soar as one, both reflecting the other’s best attributes back at each other. The light they cast is not just what they draw out of each other, but what they fulfill in each other. It is the purest form of love known to man. Spyro wasn’t Snoop’s first videogame love—”I love ‘em all,” he says; “Pac Man, the classic Mario, Kong, Frogger and more.” That doesn’t diminish the inspiring bond felt between dragon and Dogg, though. If Snoop can find such joy in these games, surely we can likewise find joy in this fractious world, whether it’s through the adventures of a purple dragon, or through some other endeavor. Snoop and Spyro remind us that not all is fear and misery, especially if an ad budget is involved. It’s a lesson we all need to reacquaint ourselves with. Before we go, here’s Spyro’s trip to a pancake restaurant in Nashville. It is the best video on the internet.